Pentagram ‘Marks’ is now quite a rare book, hard to find a new and sealed copy for a reasonable price. Expect to pay around £150 for a copy of ‘Marks’ on UK Amazon (almost $500 on the US Amazon). I infact sold a copy last year for £250 on Amazon, so some people are keen to pay good money to get their hands on this limited edition hard backed copy. Only 1,000 copies were made available for sale. Pentagram are releasing a softback version of ‘Marks’ around May, so this is a sweet opportunity to own the original limited edition version. Sweet. The incredible thing is that you will see some of these logos and think, what the hell! Some of these are as simple as you can get, and they are all displayed in black and white. You will struggle to make sense of a number of these marks, simply because even for Pentagram, not all marks work well in single colour or out of context. It will drive you to check out the company concerned to see how the logo looks ‘in context’, in it’s intended environment. Because of the No Colour and No Context presentation, it’s a valuable lesson in that logo design is not just about creating a fancy 3d transparent logos. It’s a confidence to create a mark that is right for the job in hand, rather than give in to the latest super trends that will die out by the end of the day. How do I win this sweet sweet book? Sign up to this blog’s RSS feed. Ensure you leave your Twitter Username in the comments. If you are not on Twitter then either sign up now (what you been waiting for) or leave ‘other’ contact details. A Retweet or two would be nice, but not a determining factor. I’ll probably keep this open for a few weeks to really milk it for all it’s worth. Then will post the winner on this blog after picking them randomly. No amount of begging or grovelling will increase your chances of winning, but feel free to give me something to laugh at. 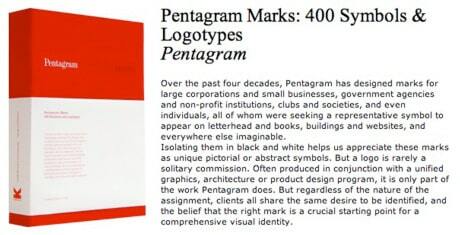 Over the past four decades, Pentagram has designed marks for large corporations and small businesses, government agencies and non-profit institutions, clubs and societies, and even individuals, all of whom were seeking a representative symbol to appear on letterhead and books, buildings and websites, and everywhere else imaginable. Isolating them in black and white helps us appreciate these marks as unique pictorial or abstract symbols. But a logo is rarely a solitary commission. Often produced in conjunction with a unified graphics, architecture or product design program, it is only part of the work Pentagram does. But regardless of the nature of the assignment, clients all share the same desire to be identified, and the belief that the right mark is a crucial starting point for a comprehensive visual identity.